Artworks are often left to the interpretations and analyses of viewers, which means that it could be seen as anything, given a frame, even that which the artist had not intended. This isn't a bad thing, and artists do want their pieces to be open to such reception, but I'm sure there's a part of them that wants people to understand what they are really saying. They are expressing something, after all. Though art pieces are sometimes accompanied by descriptions, they are brief and constructed. It's this type of boundary that art-connoisseurs (photographer) Klea McKenna and (writer) Nikki Grattan seem to have set out to overcome through their web project, In The Make (on behalf of the artists or otherwise). It's common knowledge that what you create is affected by images you see, songs your hear, stories you read, things people say to you, stuff you collect, and so on. But it's possible the influence is an unconscious one where even the artists don't know the extent to which they're being moved by their immediate surrounding – part of which they put together themselves. The interviews and photos on In The Make give great insight, in addition to showing the work processes, and even simply suggesting what glue to use. Why do you think it's important that people know what an artist's workspace and work process are like? Klea: Choosing a creative path and actually working hard at it every single day is demanding and difficult work, and often has little reward. By demystifying this process, perhaps we can draw attention to the practical means by which artists sustain themselves and find inspiration to make their work. In particular, we’ve been profiling emerging and mid-career artists, many of whom consider their process to be a crucial part of the finished artwork. Really, for me it’s all about raising awareness about art and creative work. Maybe someone looks at In The Make and feels inspired to make something themselves or to go see more art or to buy art. Our culture needs more art appreciators and hopefully pulling back the curtain on how art is made is one way to draw people in, make them curious. A question I don't like to ask in particular, but – what is art to you? Nikki: Man, that’s a lot of elusive territory to try and map. I write to think with intention, to give myself room for inquiry and discovery, and to try to get at something essential. But I know language is limited and at its best, can only grasp at and fumble for “something essential.” This is the closest to an answer I can get for this question, but I imagine writing shares a lot with other arts. Klea: Sometimes I feel like I have committed myself to art (in the broadest sense of the word) in the way that some people commit themselves to a particular religion. Making art is simultaneously disciplined work and total intellectual/emotional freedom. It’s a complicated relationship and I absolutely question its validity, but I think at this point I have gone down the path of blind faith, not necessarily in my own art, but faith in art as a crucial human activity. Do you think artists are undervalued and underrepresented in society/America/the world? Klea: Of course it’s different in each culture and each time period, but here, now? Yes. I think the arts and the labor of artists are hugely undervalued. Art is constantly being de-funded in the US and it’s visible at every level of society, but really laid bare in public education where the arts are always the first programs to be cut. If we, as a culture, really valued art, acknowledged that it enriches out lives, and respected creative work as real work, then we would teach it in our schools. We would be proud when our children choose that path rather than dismayed, and we would support it in our communities and in our public policy. The notion that many people have, that art is only for the elite, is unfortunate and self-propagating. Art is for whomever wants to participate. Yes, it costs a lot to get into a museum these days (partly because they’ve lost much of their funding) but your cable TV bill isn’t cheap either. What we need is a shift in our cultural values and that’s a lot to ask, I know. But it's not impossible. What's it like working on the project? Any difficulties, favorite parts? Nikki: We are always calling it an adventure – that’s our go-to word when people ask us about what it’s like, and it truly has been a wild, sometimes hilarious, always inspiring endeavor. Practically speaking, it’s often a gamble because we have no idea how photogenic a studio is until we step into it, but Klea is damn good at making it work no matter what. For me, the interviewing process is endlessly fascinating, because despite coming into each visit with specific questions, conversations unfurl in such unexpected and compelling ways. Sometimes it can be difficult to keep conversations focused, and other times I have to work hard to draw out ideas and opinions. It’s all about asking the right questions, really listening, and coming to the conversation with openness, respect, and curiosity. There is often a vulnerability in the artists— they are literally and metaphorically inviting us in to their personal spaces, and we try and come in gently, but still with inquiry in mind. I love when artists have little snacks and treats for us, and most of them usually do. It’s an endearing gesture and it reveals another little bit about them. I’ve kind of been keeping a mental spreadsheet of the artists we’ve visited and their snacks – It’s kind of silly, but I just love those tell-tale details. What would you say about “workspace” as an artist? Klea: Oh man, having a studio space is an incredible blessing for an artist. Virginia Woolf’s notion of “a room of one’s own” holds true even in the digital age. There is something sacred about a private physical space to think and make in. And going into someone else’s studio really is like dropping into their brain, their most intimate world. 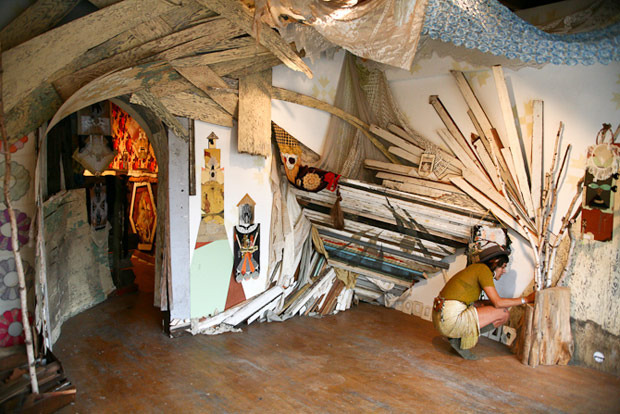 Everything about how someone inhabits their space reveals their perspective, and usually connects back to the work their making. When I photograph I look for that sort of pervasiveness of aesthetic, the way artists themselves dress like their work, or the work reflects the environment in which it was made. It’s so fun to find those little clues and it helps the photos to tell a visually cohesive story about each artist. Klea McKenna to your left and Nikki Grattan to your right. The women are San Francisco based but hope to visit artists beyond the Bay Area. Grattan is especially enthusiastic: “We will soon be taking our first trip for In The Make. We’re going to LA and we’re so exited!” Check out the entirety of In The Make. Sahara is a writer, photographer and designer based in Brooklyn.